Looking for a tropical retreat, but no time to fly to Bali or even further? The Karimunjawa Islands lie in the northern waters of Central Java Province, 120 km north of province capital Semarang. The nearest Javanese town, however, is Jepara, from which people usually depart for the islands. It takes a 6-hour ferry trip covering 83 kilometers, but it’s definitely worth it. Renowned for its picturesque beaches and rich biodiversity, it was established as a national marine park by the Indonesian government in 1999 and turned into a marine protected area two years later. The name Karimunjawa can refer to either the cluster of islands or its biggest island, where tourists usually stay in hotels or in the cheaper option, locals’ houses. The second biggest island, separated by only a thin line of water with Karimunjawa on its south, is Kemujan. Together they are surrounded by as many as 25 smaller islets, not all open for recreational visits. The two mentioned before, along with Parang, Nyamuk, and Genting, are the only inhabited islands. 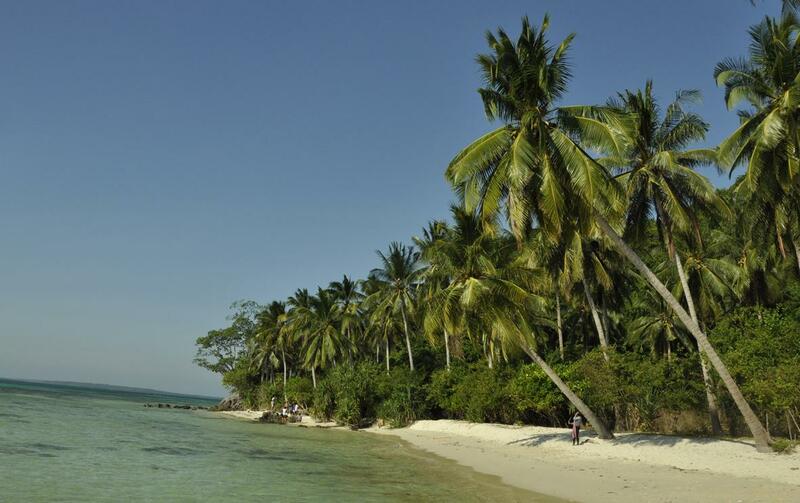 Karimunjawa has only recently attracted attention as a tourist destination. Visiting the islands, there are indeed many interesting things one can do and see. This brief introduction will outline some. As a marine park, Karimunjawa’s main feature is its underwater beauty. Around the islands Tengah, Kecil, Menjangan Kecil, and Cemara Besar, you can have a whale of a (snorkeling) time. Karimunjawa is said to have more than 90 species of coral biota, 242 species of ornamental fish, and a number of seaweed and seagrass species, which make the experience amazingly colorful. Another snorkeling spot is Gosong Cemara, not far from Cemara Besar on the west side of Karimunjawa. The diversity of fish, swimming to and fro in the bluish green water, through the colorful decorations of coral reefs makes this spot simply breathtaking. You can find Nemo here, along with his in-laws and distant relatives. Interestingly, there is also a wreck-diving spot around Kemujan Island. A ship from Panama called Indono sank there in 1955. The shipwreck may not be as notable as the Titanic or the Andrea Doria, but will still allow for that eerie feeling as you explore it. Visiting a beach in a way is like watching a good horror movie. You don’t want to do it alone, but doing it with too many people will spoil the atmosphere. Karimunjawa beaches are clean and quiet—at least until this article is finished. This makes the sunset here even more charming. Tropical breezes and sunshine will touch your skin warmly during the day, making you forget home for a while. The sands are white and the water is glistening. While many beaches are relatively pristine, some are modestly set up for tourists’ visits already. On those of Kecil and Tanjung Gelam Islands, for instance, you can find vendors selling snacks and drinks. Es kelapa muda, i.e. fresh coconut water with syrup and ice, is on tap. One of the most exiting activities in Karimunjawa is swimming with sharks at the preservation pools in Menjangan Besar Island. They are ‘tame’ and not that big, but still look scary. You might also run into other animals. Dolphins, turtles, and white-bellied sea eagles are often seen there. The national park is covered in mangrove and tropical forests. It has some endemic plants, one of which is the sacred Dewadaru tree. The inhabitants of Karimunjawa are made up of various ethnic groups, such as Javanese, Buginese and Maduranese. They are known to be adept in fishery and agricultural activities. Tourism has created new occupations, though. Many people run restaurants, lodgings, and souvenir shops. The people speak Javanese as well as Bahasa Indonesia, and are Muslims. This is understandable as geographically the archipelago is closest to the northern areas of Central Java, where Islam is the predominant religion. In fact, the discovery of the islands is explained by the locals through the legend of Sunan Nyamplungan, the son of Sunan Muria. The latter is one of the Wali Sanga, the nine saints who first spread Islam throughout Java. According to the belief, it is Sunan Muria who named the islands “Karimunjawa” (meaning “vaguely visible from Java”) after he saw his deserting son arrive there, from the peak of a mountain in Java. Sunan Nyamplungan died and is buried in Karimunjawa. He is the reason why Dewadaru trees and wood, the same material his walking stick was made of, are considered sacred by the local people. The ferryboat leaving from Jepara is called Muria (named after the Sunan) and costs Rp 30,500 (economy class, about 2,5 euros) and Rp 79,000 (VIP, about 6,5 euros) for a ride. Standard hotels like Karimunjawa Inn and Duta Karimunjawa go for about Rp 150,000 (12 euros) room rent. More luxurious hotels, such as Dewadaru and Nirvana Resorts, start from Rp 305,000 (24 euros) and Rp 425,000 (34,5 euros) respectively for a night. You can also stay in a local’s house, called ‘homestay’. These houses, such as Mulya Indah and Kalimasada, are set up to provide lodgings that cost from about Rp 60,000 (about 5 euros) a night for a double-bed room. If you’re not with a tour agency, you’ll need to rent snorkeling gear (about Rp 30,000, or 2,5 euros, a day) and a diving gear (Rp 300,000/24 euros a day).